Adaptive Infrared Imaging Spectroradiometer (AIRIS) | PSI - Physical Sciences Inc. The system employs passive multispectral imaging in the 7.3 to 11 µm wavelength region to detect target materials based on known spectral features. This spectral range, known as the “fingerprint” region of the infrared because it contains absorption bands allowing unique identification of chemical compounds, also affords excellent transmission through the atmosphere. The system’s tunable filter technology allows the optimization of spectral band selection to take advantage of these strong chemical absorptions in order to maximize information input to its spectral recognition algorithms. The system utilizes a real-time integrated processor performing spectral detection and identification in less than 1 second for complex backgrounds through the use of a highly adaptable ATR algorithm. It utilizes a proven statistical detection algorithm (Adaptive Cosine Estimator), coupled to temporal and spatial filtering approaches, such that the sensor does not require a priori knowledge of the background, also enabling ‘on-the-move’ detection. 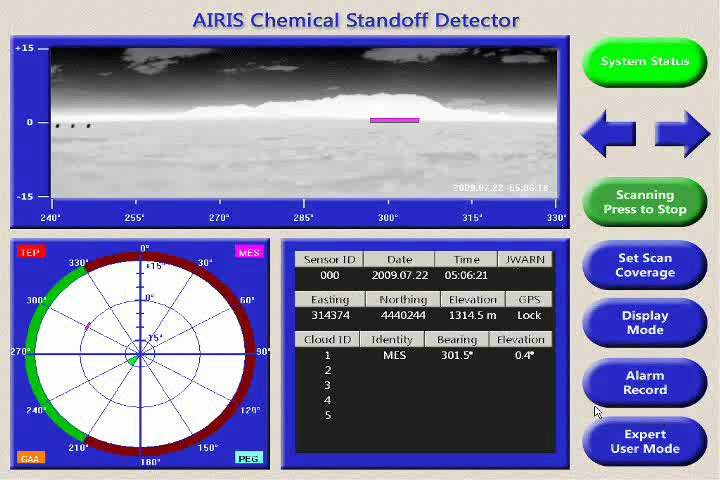 The AIRIS sensor has been extensively tested against a range of chemical vapor threats and threat environments. It is jointly marketed by Physical Sciences Inc. and Smiths Detection Inc. for use in chemical vapor sensing.